Hydro-air systems use a fuel burning boiler or hot water heater to produce hot water. 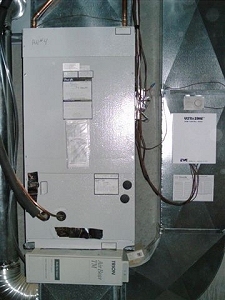 The hot water is piped to an air handler, sometimes called a fan coil. Inside the air handler is a multi-row coil, through which the hot water is circulated. Air is then passed over the coil and ducted to the space. An aquastat or time delay can be used to allow the coil to heat up before turning the blower on, preventing the discharge of cool air that can feel uncomfortable in heating mode. Accessories can include: an air filter, electronic air cleaner, high performance media filter, humidifier, and an evaporator coil for central air conditioning. A system with air conditioning might have a condensate pump to remove the water produced by the dehumidifying action of the coil. If the system is zoned, a zone control panel and motor actuated dampers will be installed on or inside the air handler and ductwork. Routine maintenance of the air handler include replacing the air filter or cleaning the electronic air cleaner grids, and cleaning the humidifier. If an oil burner is making the hot water, annual servicing by a professional is recommended, since special instruments are needed to set the burner up to the proper fuel-to-air mixture ratio. If city or propane gas is making the hot water, nothing needs to be serviced on a regular basis, unless soot is evident or low water temperature develops. Some hydro-air systems use a boiler that has anti-freeze in it. This should be tested for freeze protection and replaced according to manufacturers specifications, usually every three or four years.